Don't let this boring, no frills picture deter you from making these delicious scones. Fighting daylight and a toddler's grubby little hands resulted in this not so picturesque blog post. 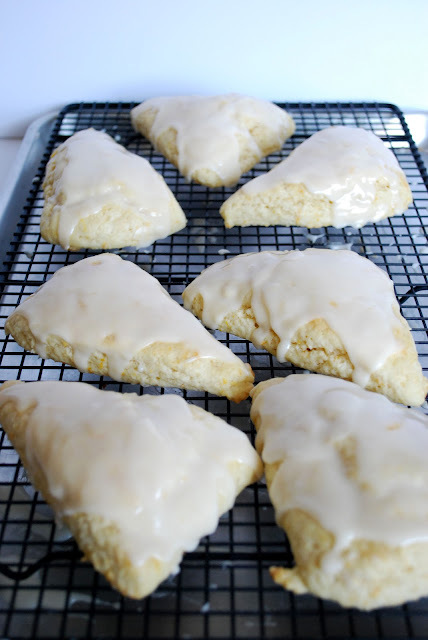 But once you bite into one of these Clementine Buttermilk Scones, you will forget about ugly pictures, grubby little hands and quite possibly the pile of laundry that has been building for the past several days. I love this scone recipe and what is great about it is that you can substitute any citrus zest and juice in the recipe. Orange. Lemon. Lime. Even grapefruit scones would be good. The scone itself is not that sweet, but that's OK because the wonderful glaze on top gives the scone the right amount of sweetness it needs. Preheat your oven to 375. Line a baking sheet with parchment paper or a Silpat. In a large mixing bowl, combine the flour, sugar, salt and baking powder. Add the clementine zest and mix well. Add the cold cubed butter and cut into the flour mixture with a fork or a pastry blender until the butter is about the size of peas. In another mixing bowl, whisk together the buttermilk, egg, and 1 tablespoon of the clementine juice. Then add the mixture into the dry ingredients and stir with a wooden spoon until the mixture comes together. Lightly flour a clean surface and gently pat dough out into the shape of a disk. Be careful not to make the disk too big, as your scones will be flat. I patted my dough out to around 1 inch thick. I then took a serrated knife and cut into 8 wedges. Brush the tops of the wedges with eggwash and place the wedges on the prepared baking sheet and bake for 12-15 minutes. Cool on a wire rack. Take 1 C. powdered sugar and the remaining clementine juice (2 T.) and mix together. Spoon the glaze over the scones while they are cooling, but still warm to the touch. This recipe made 8 large scones. I love scones! I've never considered Clementine Scones. YUM! I have this cute little crate of clementines that are just begging to be used in this recipe! I adore scones and am always looking for new ways to make them. This is on the to-make list for this week! Many thanks for sharing the recipe. These do look delicious and glad to see that you used Clemetines! You do not see much in the way of baked goods that use them. This recipe is a real keeper, glad you shared this. Yum! PS Now following your blog! Vieni a farmi visita se vuoi!! What a lovely scone recipe! I love using citrus fruits in baking! OH, how I love scones!! However they have recently been loving my waistline so much that they won't let go. These look like they are a must try though! !